An important dimension in the development of the Turning Point Suffragist Memorial is educational outreach. Our Speakers Bureau offers informative programs of varying lengths and format, ranging from 10-15 minute informational spots to more formal and lengthier AV presentations. 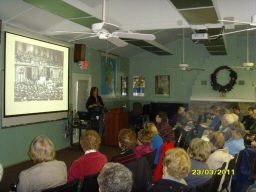 Topics include the general history of the suffragist movement, the struggle for ratification of the 19th Amendment, the National Women’s Party, the “Silent Sentinels,” the “Night of Terror” (which proved to be the turning point in achieving women’s vote), and current efforts to develop a memorial to commemorate those courageous and determined women. In southern Fairfax County, the now demolished Occoquan Workhouse, figured prominently in these seminal suffrage efforts: the women who picketed Woodrow Wilson’s White House were imprisoned at Occoquan, and were brutalized there during the “Night of Terror.”Consider including a TPSM speaker as you plan meetings for civic associations, business and professional societies, schools and clubs, or other community gatherings. Topics can be tailored to the specific interests of the target audience and the scheduling requirements of your meeting. Contact the Speakers Committee / Kathleen Pablo using the form below for further information or to request a speaker.